In college, I discovered that I loved languages. I had taken Spanish and Japanese in high school, but it wasn’t until university that I really started to find an enjoyment in language learning. It makes a certain kind of sense: I had always enjoyed games where grinding for experience mattered, and I appreciated that the more that I worked with a language, the better I got at it over time. I ended up finishing a Bachelor of Arts degree in Linguistics and Classical Studies, the latter with an emphasis on Latin. In my final semester of college, I was unsure of where I wanted to go next. I had picked majors that most of my friends and family did not understand, and people always asked me “What do you want to do with that?” after I told them about my choices. Finally, a classmate of mine told me about a graduate program at my current university that would, in a year’s time, give me a Master’s degree and a license to teach Latin at the primary and secondary levels. I had had experience before in working with younger children and teenagers during summers as a camp counselor, so the thought that I could land a job combining my love of languages with my experience working with kids sounded too good to be true. Turns out, it was. The first semester of the program was, for the most part, great. I made A’s and B’s in my classes, and my professors and classmates appreciated my input. My advisor had already placed me with a mentor teacher for student teaching, and in the first semester’s role of observing her classes in action I could tell that she was (and still is, as far as I know) a fantastic Latin teacher. As such, I went into the second semester with excitement. That second semester was primarily composed of student teaching in the very same classes my mentor teacher had taught in the previous semester, only this time with her watching and grading my performance throughout each lesson rather than my observing her. I became a fully-fledged teacher in all but official licensure, making lesson plans, grading papers, and staying after school to help students with homework. By the end of January, however, it was clear that something was wrong. My days looked like this: wake up at 6 am, go to school, go over my lesson plans for the day with my mentor teacher, teach, help students after school, then stay longer with my mentor teacher to go over improvements necessary to my lesson plans, go home, have dinner while grading papers, make more tweaks to my lesson plans, go to bed at 1 to 2 am. Doesn’t sound too bad, right, at least for grad school? What if I told you that every day that I saw my mentor teacher in the morning, she would tell me that my lesson plans were useless, and then give me something that she had taught previously to do instead? What if I told you that even when I did exactly what she said to do, I was told that I had done literally everything wrong? What if I told you that she tore apart everything I did, from waiting too long for a student to answer a question to calling on the wrong student to every aspect of my teaching? What if I told you that other teachers sent to observe me saw nothing wrong with my methods, and actually said that they thought my teaching was superb, including the principal of the school? What if I told you that my mentor teacher once told me that “Teaching is something in your blood, and if you don’t have it you have to work a lot harder,” despite the fact that my mother was a teacher and that I had won accolades for my work mentoring kids at camp and at my high school? What if I told you that for months I was bullied, harassed, and made to feel like a failure by a person who for some reason truly unknown to me had grown to hate my guts? You are probably wondering how all of this applies to Majora’s Mask. Let me tell you then. Growing up, I loved Zelda. I played A Link to the Past first, then went back and played the original, then Wind Waker, and so on and so forth. I’ve played them all at this point, but somehow at the time I had sckipped the N64 titles, and so it wasn’t until I got a 3DS that I played Ocarina of Time or Majora’s Mask. During the time that Majora’s Mask 3D came out in the US there was a lot of snowfall that made schools around my area cancel for three weeks. Also during this time, my sister went into a long and arduous labor with my nephew. As such, I found myself at the hospital for two days with my family and a 3DS for company. Luckily I bought Majora’s Mask before the snow, and so I had it handy for my sudden break from the horrors of my mentor teacher’s office. And wow, did I fall in love with that game. In the game, you play as a hero who is not sure what he is doing at first, following after something that may or may not lead to his goal of finding his friend. You play as someone who has to redo tasks over and over again, most of these tasks due to ultimately fail because time will have run out. You play as someone who, despite all of this still tries to save a land foreign to him at the start of every first day, having all that he’s worked for torn to shreds by the nature of his plight. You see where I might be going with this? My life for those months of grad school was one where doom followed me. I knew that whatever lesson plans I made, my mentor teacher would just rip them up when she saw them, before I even had a chance to try them. I taught her own lessons she had given me, knowing that I would not be able to live up to her standards despite following what she said to do to the words I used as I taught. 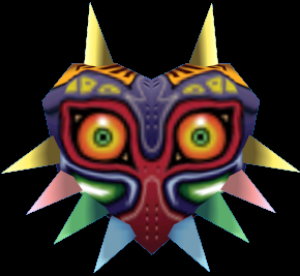 Playing a game like Majora’s Mask was so cathartic during this period because, in a way, I understood what it was like to work hard for something and know that you would fail regardless. Unlike Link with his quest, I did not finish grad school. I ultimately complained to my advisor at school, but nothing ever came of it because there was no option to switch mentor teachers. Finally, another teacher who shared an office with my mentor teacher told me “I don’t know how you put up with it, and you do it every day.” I realized that she was right, and that I did not deserve to be treated the way I was. Despite the debt that I would have for a program that I would not complete, and the fact that I would not become a teacher after all of that work, I made a choice to leave. Without an ocarina of time, I had to live with the result that the end of my metaphorical three days had brung. Majora’s Mask is often called a dark game, and it is. But somehow this darkness helped me to feel okay when all of this happened. It made me feel like my experience was not one in isolation. It made me feel okay to keep trying, despite the inevitability of my failure, and helped give me the courage to walk away when I knew there was nothing more that I could do. It reminded me that video games can be important buffers for reality, and that they can teach you lessons that coincide with what may be going on in one’s life. I may not have saved my Termina, but I did beat my Majora. I took myself away from the equation, and maybe that’s what was needed to end the cycle after all.